Chico, California-based meteorologist Anthony Watts announced on Sunday (see here) that he has discovered serious inconsistencies in the temperature data released to the public by the National Climatic Data Center (NCDC) of the United States National Oceanic and Atmospheric Administration (NOAA). This finding is important since it reveals that the widely-reported assertion that July 2012 was the hottest month in the instrumental record for the contiguous U.S. (i.e., the continental U.S., not including Alaska) is wrong. Watts, the founder, writer and owner of Watts Up With That? (WUWT), “The world’s most viewed site on global warming and climate change”, made his discovery when comparing average temperatures for the U.S., announced each month in the NCDC’s “State of the Climate” (SOTC) report, with the actual database of NCDC temperatures. 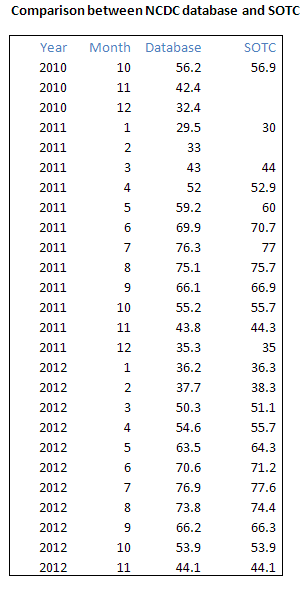 He found that there were huge differences between the two sources, as much as 0.7 degrees in July 2012, for example. Here is why this is happening. Temperature observers at weather stations send their data to the NCDC as soon as each month ends. Some stations, such as those at airports, send the data quickly via radio links and the Internet. Other stations use old paper forms which arrive by mail considerably later. NCDC does not wait for all the data to be received before computing, and very publicly announcing, the U.S. average temperature (a statistic that has questionable meaning in the real world), its rank compared to other months and years, and its severity. In cases like this where the data shows unusually high temperatures, mass media then broadly disseminate the data (e.g., “July Was Hottest Month on Record“, Wall Street Journal), loudly proclaiming it as further evidence of dangerous man-made global warming (e.g., “July in U.S. was hottest ever on record“, Canadian Broadcasting Corporation). “Hottest month in history” announcement based on incomplete data. Later analysis showed it was wrong. When the data from lower technology sources finally arrives, NCDC update their temperature database typically “cooling” the country when all the data is used. 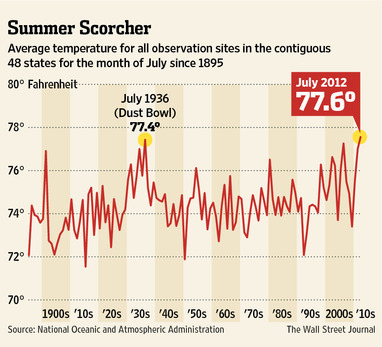 For July 2012, the real temperature average became 76.93 F, almost 0.7 F lower than that announced in the SOTC. July 2012 then became about 0.47°F cooler than 77.4°F claimed as the previous monthly record in 1936. But neither NCDC, nor their parent body NOAA, bother to tell the public and the press if, when the complete data set is analyzed, the announcements in the SOTC about records set, etc. are no longer true. So the public, media and politicians are left with the impression that records were set when, for example in the case of this past July, they were not. How will NOAA respond to this disturbing finding? I will updates readers in future FCPP blog posts. Update – see here for part 2.